What is the difference between “this year” and “next year?” In January, I usually find myself naturally shifting to talking about the coming growing season as “this year,” but right now, in January 2013, last year is still this year. As we mentioned when last we blogged, back in October, we were hoping for a long mild fall. We always plant our fall and winter crops with the hope that we will get the weather that allows us to continue to harvest and market until at least Thanksgiving, but we don’t bank on it. In our budget, we assume that we will get a knockout flood or freeze on November 1st, so we plan for the worst, and hope for the best. This year we got the best. We continued to attend our Sunday farmers market on Broadway through December 23rd, not just with a few baskets of boring root vegetables, but with kale, chard, salad greens, radicchio, spinach, and, yes, roots. Local Roots. Besides that, we also managed to tack an extra three weeks onto our regular CSA season, and continue (present tense) to sell to our most dedicated restaurants on into the previously uncharted territory of January. So. What year is it? The harvest of 2012 crops continues unabated. 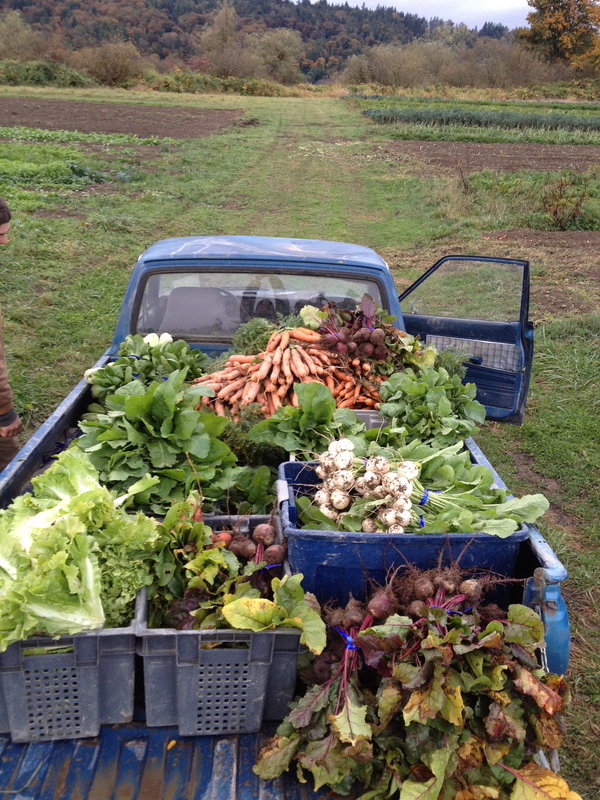 This past Sunday, we loaded up the van with bins full of carrots and parsnips, plus whatever leafy greens we could muster during the brief daylight hours on Saturday, and headed into Seattle. We parked on the street in front of our normal farmers market spot, and proceeded to sell vegetables off the back of the truck. I think they call that truck farming. Will it ever stop? Yo, I don’t know. We still have about 4,000 pounds of carrots out in our field, so we’ll be back parked on the street on Broadway again in a couple weeks. We’re also hard at work on our normal “off-season” jobs of budget writing, crop planning, and seed ordering, as well as tuning up the tractors, cleaning up the greenhouses, and generally hatching plans. 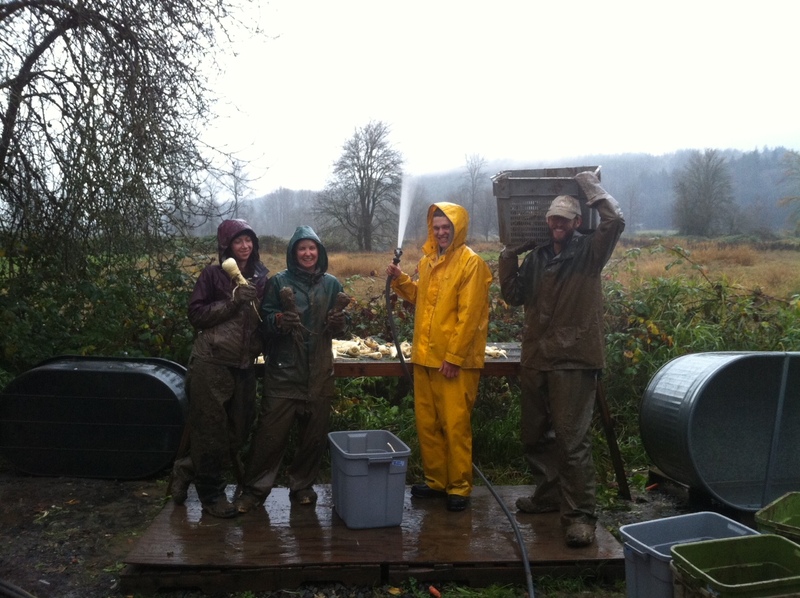 Finally, we are supremely happy to have four members of our 2012 farm crew returning for 2013 (or whatever this year is). This only adds to the time-warp feeling that 2012 is the year that will never end… In closing, our apologies for the long delay in blog. I hope what has been described herein is a sufficient excuse. Plus, big farm news coming soon! Stay tuned! We here on the East Coast can totally relate. We have broccoli raab flowering right now in Jan. WTW is up with that?! Glad to hear we’re not the only ones scratching our heads regarding the season of (natural) extension. 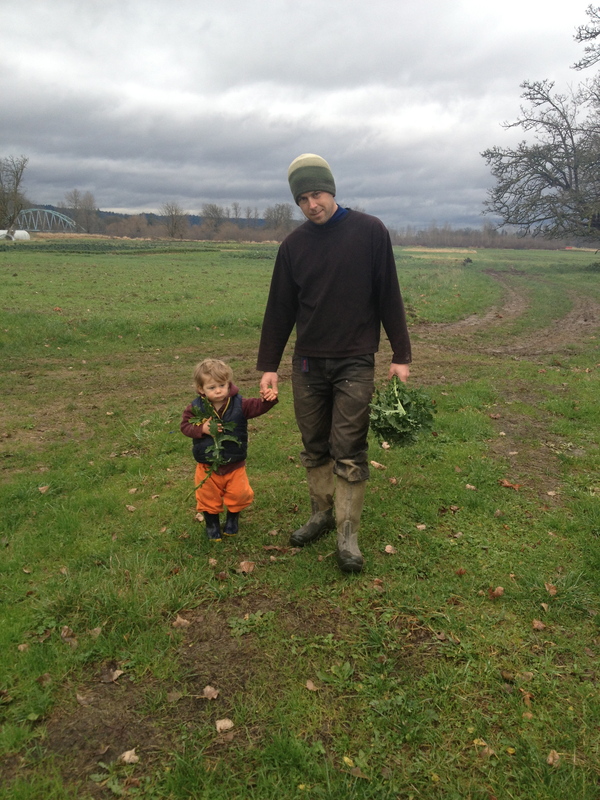 OBTW, we were in the PNW this week visiting family and wondering how the heck market farmers get past the rain and cold. I guess it’s a matter of perspective. July and August are killer here and you’all are glowing in warm, mild summers. Great blog, keep-up the fine work!